The annual celebration, held on 16 June 2016, celebrated 400 years since the death of William Shakespeare. HMA Emma Hopkins OBE delivering her speech. This year the Queen’s Birthday Party celebrated the 400th anniversary of Shakespeare’s death. The event was kindly sponsored by UK business leaders - Provident, Deloitte, WYG and CertAsig. Ladies and Gentlemen, distinguished guests and friends, welcome to our National Day – the Queen’s Birthday. Thank you all for joining me here to celebrate this occasion. This year, it is a very special occasion because Her Majesty reaches a milestone in her life - her 90th Birthday. Last year, the Queen became the longest serving of all the 40 English monarchs – she has reigned for over 64 years. Therefore, I would like to ask you all to raise your glasses in a toast to the Queen – To the Queen! But we are also here to celebrate another UK icon – William Shakespeare. It is 400 years since his death. But Shakespeare, more than anyone else, through his wonderful plays about the history of our Kings and Queens, has shaped our understanding of the Monarchy. If you cannot find the words look to Shakespeare. He has been translated into over 100 languages. Including here in Bulgaria with some wonderful translations by Professor Shurbanov. His work covers the whole range of human emotions and experiences, including love and hate, revenge and jealousy, loyalty and betrayal, greed and power. It is thanks to his supreme ability to capture the essence of the human condition that his work continues to teach the world about the virtues and follies of Leaders; the power of justice and love; and that we use his words to continue making the case for equality for all. These themes - leadership, justice, and equality - are reflected in the quotes scattered around the garden tonight. In Shakespeare the characteristics of our leaders are laid bare, and we are invited to draw lessons from their stories. In his plays our leaders are tragic and flawed. He reminds us to never place them on a pedestal or above the rest of us. But he also shows how great leaders overcome their personal demons and inspire us all. When Richard the Second is told - “Landlord of England art thou now, not King” – it teaches us that leaders are servants of the people and their tenure is temporary. A lesson that is re-enforced when he loses his throne! Henry the fifth’s leadership is still cited in contemporary management handbooks. When he shouts “once more unto the breach!” he is the first to lead the charge. But, as in our own lives, in Shakespeare the consequences for wrong doing are also clearly set out. Madness, death and sorrow come to you for doing bad things! As a former barrister I can definitely say that justice in Shakespeare is very swift! Take Lady Macbeth she is never able to wash the blood from her hands. As she sleepwalks and cries - “Here’s the smell of the blood still: all the perfumes of Arabia will not sweeten this little hand.” It is clear from this that what you do in life can define you long after the deed is done, and that sometimes your own ambition can have ruinous consequences. Shakespeare was always ahead of his time. But especially when it comes to issues of equality. This is most clear in his plays The Merchant of Venice and Othello. In Othello, we are shown how the assumptions around race are meaningless. In the play the villain is Iago, a white Venetian, and he makes Othello the victim. Othello is always noble, thoughtful and full of the passion of life, despite being prejudiced against through the majority of the play. In the Merchant of Venice the character Shylock, a Jew who is also openly discriminated against, makes one of the most eloquent arguments for equality and fair treatment ever made. He asks – “If you prick us, do we not bleed? If you tickle us, do we not laugh?” – in doing so, with such simplicity, he delivers a message for equality with more weight than a thousand speeches! For these reasons I am excited that the British Government is taking Shakespeare around the globe this year. Whether we are working together on judicial reform, or supporting Bulgaria at the EU border or promoting equality between the genders, for children or minorities, the UK is working together with Bulgaria’s leaders. 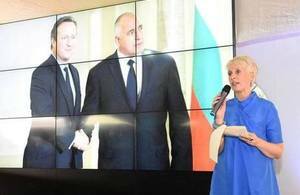 In the last year I believe the UK and Bulgaria have become truer and closer friends. During his visit here in December, Prime Minister Cameron demonstrated the depth of our friendship by visiting Bulgaria’s borders and offering direct assistance to help to police them. During his visit he was struck by the beauty of the country and by professionalism of the Bulgarians he met there. He also got the chance to experience real Bulgarian hospitality! During the visit we were also able to show the Prime Minister Bulgaria’s growing innovation sector. With my team in the UK Trade and Investment section, we work to make Bulgaria a destination of choice for UK companies. In the past year the Embassy team and I have worked hard to meet many of you, across the whole of Bulgaria. I am proud to be working with you and to make sure that the long standing friendship between the UK and Bulgaria continues to grow and prosper.